If you were of a mind to, you could perhaps identify two dominant movements in contemporary circus. Both are about that ridiculous word 'truth'. Where is the truth? Where is the essence? For one set of practitioners it's in the skill, and the unique properties of the disciplines, and the dramatic tensions they encode – a sort of poetry; for another the truth is the sweat and the work that makes the performance, and so the ordinary behind the extraordinary: these people are like you and me, it says, if a little more obsessive, a little more driven. Undermän is firmly in the second category, a production that works at all times to strip back artifice. 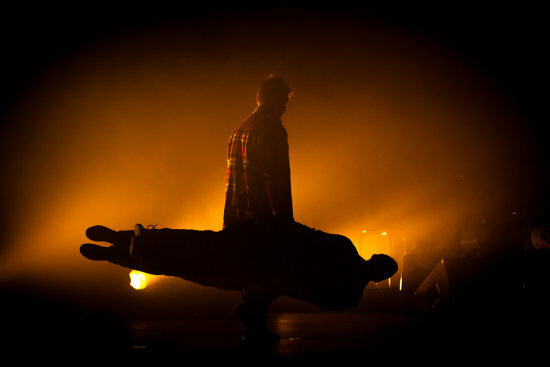 The costuming of the three performers – Peter Åberg, Mattias Andersson and Matias Salmenaho – is that they all wear lumberjack shirts. They bring their own equipment on stage and off. One of them wears glasses – and I'm sure it's the first time I've seen a circus performer wearing glasses onstage that aren't a prop to show that he/she is a city worker or nerd. The guy just wears glasses. Their life stories are the weave of the show, as the three, all hand-to-hand porters, each tell of losing a partner. Mattias Andersson's tale of passion, love, Vegas and loss is the straightest, ending with a performance of his old routine where the flyer, spun and thrown and cradled, has become empty air. But in the other two spoken sections (each of the men comes forward, at points in the show, to talk into a low front-of-stage mic), there's a particular, angled way of talking about personal history by not talking about it – walking only around the edge of an event or experience to show its shape. After solving a rubik's cube while balancing a tower of plastic straws on his chin, Peter Åberg talks about his relationship by veering instead into an explanation of the algorithms for common, then rare, cube solutions (breaking out some incredible jargon that sent me down the rabbit hole the evening after the performance), the scene both a perfect example and a kind of parody of the idea that a physical feat somehow compresses all the years it took to achieve it. For the stolid Matias Salmenaho the story is that of a life on perpetual tour – hinted at as he juggles kettlebells accompanied by a recording of an interview with a childishly hyperactive and attention-deficient American radio host, but told most eloquently in the opening and closing images of Undermän, as Matias carries his two co-performers, not the lightest you could hope for, on and off as suitcases. As much as it seems like an insult, the three put me in mind of a reformed boyband – older but not old, well-travelled, a little tired, examining now the damage that success has brought to their lives. As well, they are a band – playing the music of the show with (I got the impression perhaps just for these local performances) the help of the musician Andreas Tengblad. The risk of it all becoming a hokey and over-earnest replica of a gig in a friend's garage is understood and avoided by the show's keen sense of when to deflate itself – so as, in an echo of Peter's own story, the audience are encouraged to get up and swap seats for 'the chance of something special' the three guys cover the pause by serenading the audience with a (presumably painstakingly rehearsed) cover of Dancing On My Own played on two stylophones and a handheld drum pad. In the end, Undermän is touching and artfully simple, and you might just be surprised by the emotional weight of its closing scenes. Its heart is so open that afterward there's not much to unravel or dwell on except what the show might have caused you to remember – but what else do you need? For more on Poetry in Motion and Undermän see John Ellingsworth's in-depth interview with director Olle Strandberg in Sideshow Magazine Issue 2.